Pre-Code Hollywood explores the fascinating period in American motion picture history from 1930 to 1934 when the commandments of the Production Code Administration were violated with impunity in a series of wildly unconventional films-a time when censorship was lax and Hollywood made the most of it. Though more unbridled, salacious, subversive, and just plain bizarre than what came afterwards, the films of the period do indeed have the look of Hollywood cinema-but the moral terrain is so off-kilter that they seem imported from a parallel universe. In a sense, Doherty avers, the films of pre-Code Hollywood are from another universe. They lay bare what Hollywood under the Production Code attempted to cover up and push offscreen: sexual liaisons unsanctified by the laws of God or man, marriage ridiculed and redefined, ethnic lines crossed and racial barriers ignored, economic injustice exposed and political corruption assumed, vice unpunished and virtue unrewarded-in sum, pretty much the raw stuff of American culture, unvarnished and unveiled. No other book has yet sought to interpret the films and film-related meanings of the pre-Code era-what defined the period, why it ended, and what its relationship was to the country as a whole during the darkest years of the Great Depression...and afterward. Pre-Code Hollywood explores the fascinating period in American motion picture history from 1930 to 1934 when the commandments of the Production Code Administration were violated with impunity in a series of wildly unconventional films -- a time when censorship was lax and Hollywood made the most of it. Though more unbridled, salacious, subversive, and just plain bizarre than what came afterwards, the films of the period do indeed have the look of Hollywood cinema -- but the moral terrain is so off-kilter that they seem imported from a parallel universe. In a sense, Doherty avers, the films of pre-Code Hollywood are from another universe. They lay bare what Hollywood under the Production Code attempted to cover up and push offscreen: sexual liaisons unsanctified by the laws of God or man, marriage ridiculed and redefined, ethnic lines crossed and racial barriers ignored, economic injustice exposed and political corruption assumed, vice unpunished and virtue unrewarded -- in sum, pretty much the raw stuff of American culture, unvarnished and unveiled. No other book has yet sought to interpret the films and film-related meanings of the pre-Code era -- what defined the period, why it ended, and what its relationship was to the country as a whole during the darkest years of the Great Depression ... and afterward. 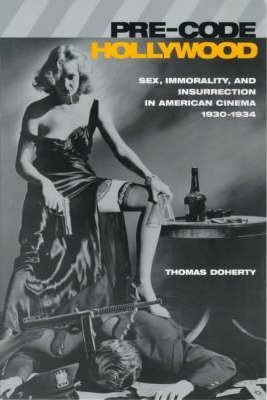 Thomas Doherty is associate professor in the American Studies Department and chair of the Film Studies Program at Brandeis University. He is the author of Projections of War: Hollywood, American Culture, and World War II (Columbia, 1993) and Teenagers and Teenpics: The Juvenilization of American Movies in the 1950s, and is associate editor of the film journal Cineaste.